Allcox Insurance Agency, a Wisconsin-based insurance company that provides services to family and business clients in and around the Green Bay area, is launching a charity drive in cooperation with Ronald McDonald House aimed at providing support to the families of children receiving treatment in local hospitals. 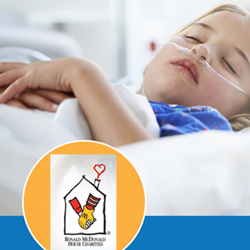 The Ronald McDonald House group of charities is committed to keeping families close to sick and injured children. By offering families a peaceful location to rest, families are able to spend quality time with children who are undergoing procedures or receiving life-saving care in nearby medical facilities. “The Ronald McDonald House charity has helped countless families in our area and across the country and we hope everyone in our community will stand with us during this charity drive,” says Jon Allcox, owner and director of Allcox Insurance Agency. To gather support from community members and business owners throughout the area, Allcox and his team are utilizing email and social media to share information about the RMH charity event. The Allcox team will also be producing a full page feature article about the charity drive in the next issue of the firm’s monthly online magazine “Our Hometown”: http://www.allcoxinsurancegroup.com/Our-Hometown-Magazine_39. The Allcox Insurance Agency has assisted several other Wisconsin-based charitable causes over the past few months. As part of a permanent community enrichment campaign, the firm will be selecting and working with more charities in the Green Bay area at the rate of one every 60 days. Those who wish to join Allcox and his team during the Ronald McDonald House charity event are encouraged to visit the Allcox Insurance website and make a personal contribution to the effort from this page: http://www.allcoxinsurancegroup.com/Supporting-Local-Families-In-The-Community_14_community_cause. Those interested in finding out more about charities and causes in the Green Bay area previously supported by Allcox Insurance Agency can do so from the firm’s Community Causes page: http://www.allcoxinsurancegroup.com/community-cause. The goal of the Allcox Insurance Group is to provide unparalleled service by offering premium quality insurance protection and knowledgeable assistance in planning and managing investments, retirement accounts, and college savings plans. With an entire staff that hails from the northeastern Wisconsin, Allcox is extremely loyal to the local community and guarantees a stress-free and gratifying experience for all clients. When you deal with Allcox, expect honesty, fairness and integrity, now and in the years to come. To speak with a helpful representative from Allcox Insurance Agency, visit http://www.allcoxinsurancegroup.com/ or call (920) 498-3630.